Reese is a small brindle girl that raced at 57lbs but has put on a few lbs since retirement and now weighs 62lbs. She has a gorgeous shiny coat and is a darker brownish brindle with black stripes and a little white on her nose. Her pictures don't really show how pretty her coat is or what a gorgeous unusual color she is. She passed her cat test at the track so should be able to live in a home with cats or small dogs. Her Sire is Ebony River and her dam is Celtic Cross. She is 4 years old and was born on August 5th. She was a successful racer with 145 races to her credit. Reese is friendly, sweet and loving and really wants to be a lap dog. 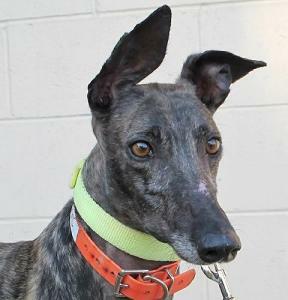 She is a very calm and laid back girl that has been great in her foster home and settled right in easily. She pottied well on leash so may do OK without a fenced yard. She has fussed some when left alone in her kennel so may not be a good dog for an apartment. Reese has an underbite so had to have two of her canines removed and the others are very short. This allows her tongue to escape sometimes as you can see in some of her photos. This is a super sweet, outgoing, loving girl!